Just today I came across this recipe on Pinterest and because I was going food shopping already, I jumped at the opportunity to make it! It's my go-to when I'm in a cooking rut. This recipe (originally found on SkinnyChef.com) is super simple and calls for everything people normally have in their kitchen. Cheers for simplicity! The only items I had to purchase were the apples and the brown sugar. This made it completely inexpensive, too! This is what they looked like before they were cooked. They were still delicious looking, but let's fast forward 3 hours later, shall we? With the resemblance of tomatoes and the filling looking like crispy bacon bits (yum by the way), I knew they were done. I double checked by piercing them with a fork. Sure enough, they were perfect! This is the look of them when cut in half. Absolute perfection! Essentially, it is like an apple pie -my all time fave- without the crust! 1. She gives you 2 options for apples to use. I chose Gala. They're sweet and delicious. 4. I used the recommended amount of apple juice to the bottom of my Crock Pot. I found afterward that it seemed like it wasn't enough. Next time, I may try upping the amount to 3/4 of a cup instead. What's the worse that could happen? These are obviously only suggestions. You can alter it to your liking. Check out the full recipe and more HERE. It's sure to be a family favorite in no time! Oh I can't wait to hit up the orchard this season, will definitely be making these. Thanks for sharing again at the #WWDParty. This looks rather delicious and being an apple pudding fan I think I'll give it a go. Oh, how easy, and it looks delicious. Yum! This looks delicious! I have made these in the oven before, but the crockpot sounds like an awesome idea! Pinned and shared to Facebook! Mmmmm!! 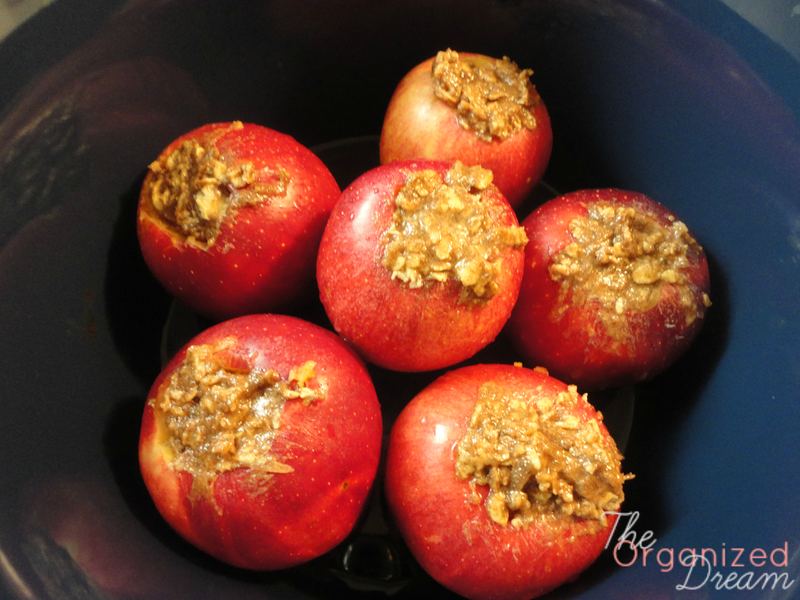 I LOVE baked apples, but I've never made them in the crockpot before! I may need to do this today. Our fridge died last night & we had to throw everything away, so I'm going marketing today. I think I need to add these ingredients to the list! Love this , you should post it to out link party. What a great recipe for this time of year! Looks yummy. Thanks for linking up with us at the Merry Monday Link Party! See you again on Sunday night! Looks so good. Pinned & shared. I've never made apples in the crock pot but, will now! Thanks for joining the Inspiration Spotlight party!